How to use Fullscreen mode on Multiple Monitors? I want to use an external display(s) with my Mac and Parallels Desktop, is that possible? Parallels Desktop will be able to use any display that is successfully connected to Mac. You do not need to connect a display to virtual machine directly. However, to use Parallels Desktop virtual machine on external display(s) you need to enable this feature: open Mac System Preferences > Mission Control > enable Displays have separate Spaces option. NOTE: Use All Displays in Full Screen option is not available for the virtual machines with macOS guest operating system due to technical reasons. NOTE: if you have more than two displays, it is not possible to select what displays to use with virtual machine and what not. You can use either one display or all of them. 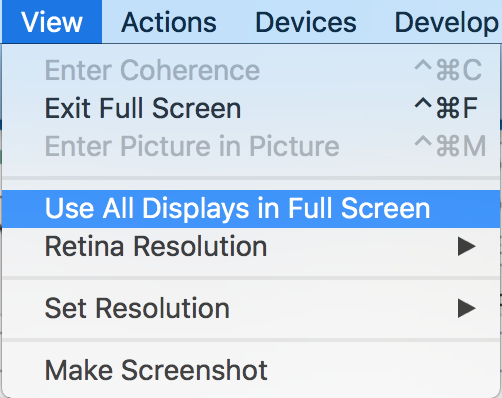 Displays arrangement should be done in macOS System Preferences > Displays > Arrangement. Parallels Desktop will detect displays arrangement and apply the same for the virtual machine. It is not possible to arrange displays in a virtual machine directly. Windows virtual machine can control display gamma when corresponding feature is enable at virtual machine configuration > Options > Full Screen > Advanced > enable Use Windows gamma settings. If you frequently switch between macOS and Windows virtual machine, and you want Windows to show its spaces on all displays once you activate one of them - you can enable corresponding feature at virtual machine configuration > Options > Full Screen > enable Activating virtual machine shows all its spaces feature.